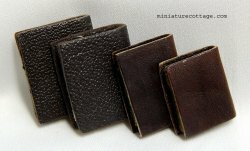 Tasteful set of four leather bound books that would made a great addition to any liabrary. The first two books mearsure approximately 1" tall and 3/4" deep. The third one measures approximately 1" tall and 3/4" deep. The fourth one measures approximately 3/4" tall and 3/4" deep.